Perfect Pear Salad Recipes | Gina Miller's Blog - A working mom's blog about fitness, travel, handbags & beauty. With a plethora of pears at the supermarket right now, it's a perfect time to experiment with them. Not only does my 11-month old love them sliced but they're a perfect fruit to add to salads. 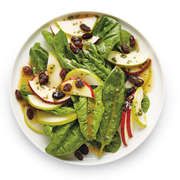 The New York Times' Mark Bittman hits another home run with his 10 recipe suggestions for pear salads. From a pear relish to a spinach and apple recipe these look delicious and are so easy. I always appreciate his recipes for their simplicity and seasonality. I prefer to dress my salads simply with a good balsamic vinegar. Perfection!